The Lenovo Tab P10 is a 10.1-inch Android tablet with middle-class specifications and up-to-date software. Starting at around 300 US Dollars it also offers premium features like four speakers and a fingerprint scanner. Here is everything you need to know about the Lenovo Tab P10. That includes full specs, prices, and even possible alternatives. The Lenovo Tab P10 has a quite interesting design that resembles a lot of higher-end smartphones. In fact, like those, it features a front and back made of glass. That is held in place by a full metal frame that goes all around the tablet. Because of that, it should be quite premium-feeling. And indeed, it is very thin with just 7mm and weighs just 440g. On its sides, the Tab P10 features a USB C port, a microSD card slot, and a standard headphone jack. There is another PIN connector on the bottom for an optional keyboard. On the top and bottom, we get two speakers each which are angled up a bit. So, there are four speakers in total. The cameras have a resolution of 8 and 5 megapixels. We also get a fingerprint scanner underneath the screen. Lenovo is betting on a Qualcomm Snapdragon 450 SoC. That is an octa-core chip with eight cores clocked at up to 1.8GHz. Additionally, the tablet features up to 4GB of RAM and an up to 64GB internal storage. Out of the box, the Lenovo Tab P10 is running Android 8.1 Oreo. However, as of now, we don’t know if it will ever get an update to Android 9.0 Pie. 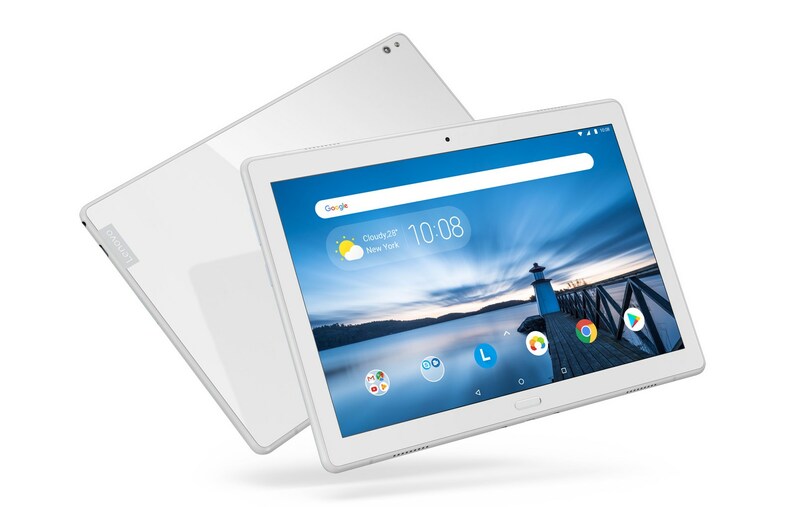 Lenovo announced the Lenovo Tab P10 August 2018. The first couple of devices started to ship in October in Europe. Countries in Asia and the United States should follow soon. Prices start at around 300 US Dollars but vary by market. As you might imagine, there are a lot of interesting alternatives to the Lenovo Tab P10. A direct one is the Samsung Galaxy Tab A 10.5 which features the same Snapdragon 450 chipset. While it is just a bit bigger, it has a full plastic body only. Other features like four speakers and Android 8.1 Oreo are similar. However, in the past, Samsung has been much better with software updates. Huawei’s MediaPad M5 Lite 10 is another direct alternative. In fact, the Kirin 659 should be just a bit faster. While a lot of premium features are similar, you can also use an active pen on the Huawei tablet. Prices are almost identical as well. The Lenovo Tab P10 has a lot of good premium features at an affordable price. In fact, the speakers, the fingerprint scanner, and the design quite high-end. Other aspects like the display and performance are good too. Sadly, you cannot watch Netflix in HD though. Otherwise it's a good value.